HAMILTON - Justin Medlock gave the Hamilton Tiger-Cats another shot at the Ottawa Redblacks. 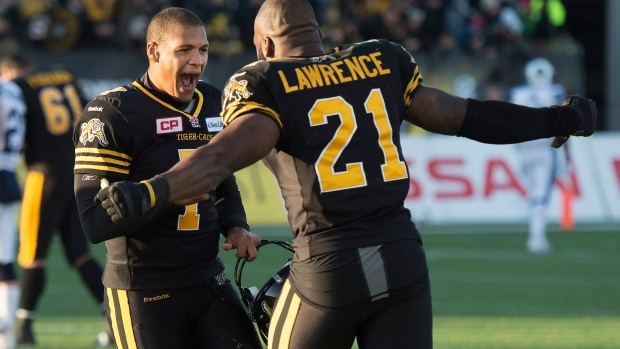 Medlock's 46-yard field goal on the final play earned Hamilton an exciting 25-22 East Division semifinal win over the Toronto Argonauts before a sun-drenched Tim Hortons Field sellout of 24,029. The Tiger-Cats head to Ottawa next weekend in the conference final after suffering two late-season losses to the Redblacks. Medlock was more than comfortable having Hamilton's season resting on his shoulders. "I knew (the kick was good) as soon as I hit it." The winning boot wasn't nearly as difficult as the one Medlock envisioned. "They're always a little longer in my head," he said with a smile. "I'm thinking I'm going to set a career high." Medlock nearly re-wrote the CFL record book in the first half. His 55-yard field goal to open the scoring was one yard short of the league playoff record. Medlock's heroics came after Toronto's Swayze Waters hit a 42-yard field goal with 49 seconds left to make it 22-22. However, Waters missed from 39 and 40 yards earlier in the quarter. Medlock's kick with a 23 kilometre-an-hour wind at his back capped a smart 40-yard drive engineered by Hamilton quarterback Jeremiah Masoli, starting his first CFL playoff game. The march was helped by a roughing-the-passer penalty against Toronto's Martin Wright, who appeared to be blocked into Masoli. "You guys know I saw," Toronto head coach Scott Milanovich said. "I'm not going to get fined." Still, Milanovich felt good having the game come down to Waters, the CFL's 2014 top special-teams player who battled injuries this year. "Swayze has been a money player for us ever since he's been here," Milanovich said. "Any time I can send him out there I feel good about it. "The wind was tough, he just pulled it." Masoli finished 12-of-18 passing for 141 yards with a TD and interception. He also ran for 58 yards on 12 carries, his one-yard touchdown scamper at 6:14 giving Hamilton a 22-19 advantage. The playoff win was heady indeed for Masoli, who began the season fourth on Hamilton's depth chart and spent time on the practice roster. He was the club's fourth different starter this year and was under centre with incumbent Zach Collaros (knee) and backup Jeff Mathews (concussion) out. Masoli left the game for two series in the third. Upon his return, he completed his final seven pass attempts for 115 yards and a TD while also engineering the game-winning drive. "We just wanted to get Masoli out of the game . . . and talk through what we were going to do moving forward, just settle him down a bit," said Hamilton head coach/GM Kent Austin. "It shows you the individual that he is. "To respond like that having not played and been on the practice roster, I can't say enough about the man." Masoli said he got a different perspective of Toronto's defence from the sidelines. "I used that as an opportunity to kind of look at the defence from the back and just see what they were doing spacing-wise," he said. "They made a couple of minor adjustments that I was able to see." After waiting until the middle of last week to name Masoli the starter against Toronto, Austin immediately anointed the former Oregon Duck as his No. 1 in Ottawa. Austin added he was proud of how Masoli has handled himself with the Ticats. "That feels good," Masoli said. "Any time you can please your boss like that and says he's proud of you, it makes you feel good. "I'm very appreciative of the opportunity. It's very exciting to just play another week." Hamilton will head to Ottawa having snapped an ugly three-game losing streak. More importantly, Masoli said his teammates will be anxious for redemption against the Redblacks, who clinched first in the East with the two wins over the Ticats. "Those guys are a good team, they beat us for a reason," Masoli said. "We're looking to get back to work and get back up there." Toronto continued its struggle at Tim Hortons Field, dropping to 0-6 there all-time — 0-4 versus the Ticats and 0-2 in games relocated due to scheduling issues at Rogers Centre. Toronto starter Ricky Ray was 22-of-34 passing for 220 yards with a TD and interception in his third start of the season. The 13-year CFL veteran spent the first half of the year recovering from off-season shoulder surgery. Ray's nine-yard TD strike to Chad Owens at 9:02 of the third gave Toronto an 18-6 lead, a drive continued by a successful challenge of an incompletion that resulted in a 15-yard completion. But Hamilton — after earlier surrendering an interception and turnover on downs — countered with Masoli's 41-yard TD strike to Bakari Grant at 12:31 as defender Akwasi Owusu-Ansah fell on the play. Ray said Toronto didn't do enough with the wind. "We didn't take advantage of when we had the wind enough," he said. "And then obviously when you go into the wind, you have to find a way to eke out points as well. "We just weren't able to score enough today." Toronto heads into a busy off-season as Ray, Waters and backup quarterback Trevor Harris top its list of potential free agents. Medlock booted three field goals and two converts. The other points came on a safety. Brandon Whitaker scored Toronto's other touchdown. Waters kicked two converts, two singles and two field goals.